bullydog.com | 940-783-9914 sctflash.com | 888-612-0852 bullydog.com | 888-612-0852 Livewire TS Now with switch-on-the-fl y power levels The Livewire TS unlocks your vehicle's hidden performance by re-calibrating your vehicle's computer for Maximum Horsepower & Torque, Increased Throttle Response, Firmer Shifts and even Increased Fuel Mileage. 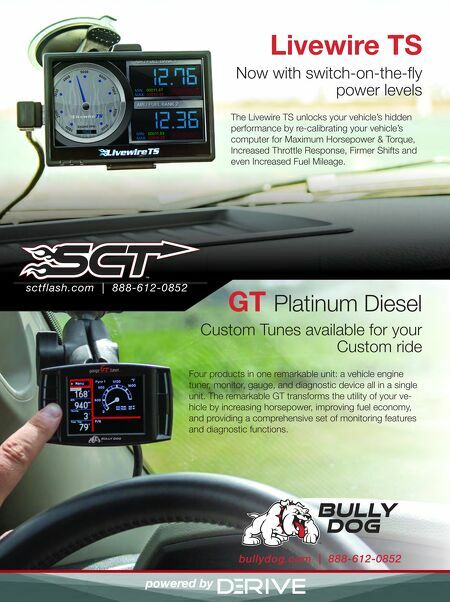 GT Platinum Diesel Custom Tunes available for your Custom ride Four products in one remarkable unit: a vehicle engine tuner, monitor, gauge, and diagnostic device all in a single unit. The remarkable GT transforms the utility of your ve- hicle by increasing horsepower, improving fuel economy, and providing a comprehensive set of monitoring features and diagnostic functions.